Antibodies are generated by immunization of host animals with an immunogen such as synthetic peptides, full-length proteins, protein fragments, cells or whole organisms. It is important to note that a positive ELISA or Western blotting against the immunogen does not guarantee the specificity of the antibody for the endogenous target protein and further validation studies are necessary. A rat monoclonal antibody, CHU61B, was raised using recombinant PIM2-His protein as the immunogen. 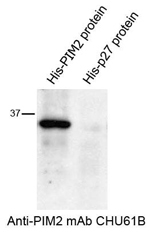 This antibody was tested in a Western blotting assay against a PIM2-His recombinant protein and the results are shown below. Figure legend Western blotting of antibody CHU61B and PIM2-His recombinant protein. A single band at 35 kDa was observed demonstrating that the rat monoclonal antibody CHU61B recognised the PIM2-His recombinant protein used in its production. No band was observed in case of HIS- p27 protein (negative control) Although important, this result does not confirm the specificity of the antibody and further validation is necessary. Cells transiently transfected with a cDNA encoding the target antigen represent a valuable tool with which to further determine the specificity of an antibody. Negative controls could consist of cells transfected with a cDNA encoding an irrelevant protein or the vector only as well as cells lacking the target antigen. The cells can then be used to make cytospins for immunocytohistochemical labelling or cell pellets for Western blotting studies. It is important to note that while these methods provide evidence that the antibody detects the target protein they do not prove the specificity of the antibody. Furthermore, although able to detect the highly expressed target protein in the transfected cells, it is possible that the antibody may not be able to detect lower levels of endogenous target protein in different cells and tissues. The HEK-293T cell line was transiently transfected with cDNA encoding either PIM2 or the unrelated protein PLK-1. Cytospins and cell pellets made from these transfected cells were then used in immunohistochemical and Western blotting assays. The results are shown below. Figure legend Investigation into the recognition of endogenously expressed PIM2 in PIM2 transiently transfected HK293T cells. A) Immunoperoxidase labelling confirms that the CHU61B antibody recognized PIM2 protein (brown) in frozen cytospin preparations of HEK-PIM2 transfectants. No labelling was observed in the cytospin preparation of Plk1 transfected cells used as a negative control. Cell nuclei were stained with haematoxylin. B) Specificity of the antibody for PIM2 recombinant protein was further confirmed by Western blotting using cell extracts of cells transfected with either HEK293T-PIM2 or HEK293T-Plk1 expression vectors. A 36 kDa band (expected molecular weight) was detected in HEK293T-PIM2 cell extract but was absent in HEK293T-Plk1. Tubulin was used as a loading control. There are a variety of methods that can be used to determine whether an antibody recognises the endogenous expression of the native target protein. These include immunohistochemistry, flow cytometry and immunoprecipitation. Western blotting is generally the primary validation step that is routinely used to determine whether an antibody recognises the denatured target protein. It is, however, important to note that Western blotting cannot be an absolute standard for antibody specificity for all applications. Many antibodies that work by Western blot may not work in other assays, such as immunoprecipitation and immunohistochemistry on fresh or frozen cells that require the detection of antigen in its native conformation. Furthermore, the inclusion of the appropriate positive and negatives controls is essential for assessing whether or not the antibody recognises the endogenous target protein. Cell lysates prepared from HEK-PIM transfectants, Jurkat (T-lymphoma derived), Ramos (Burkitt’s lymphoma derived), RPMI-8226, OPM-2, U266 (myeloma-derived) and Raji (B-cell lymphoma derived) were used in Western blotting and immunoperoxidase staining techniques to ascertain whether antibody CHU61B recognized endogenous PIM2 protein. Figure legend Western blotting and immunolabelling studies to investigate the recognition of endogenous PIM2 by antibody CHU61B. Western blotting was performed using extracts of HEK-PIM1 and HEK-PIM2 transfected cells and the Jurkat, Ramos, RPM1-8226, OPM2, U266 and RAJI cell lines. The CHU61B monoclonal antibody detected a 26 kDa band in the HEK-PIM2 cell extracts that was absent from the HEK-PIM1 transfectants. Of interest was the finding that two or three different bands corresponding to the different PIM2 isoforms of 34, 37 and 40 kDa were also observed in extracts from the PIM2-positive Ramos, RPM1-8226, OPM2, U266 and RAJI cell lines. In contrast no band was detected in the PIM2-negative Jurkat cell line used here as a negative control. β-tubulin was used as a loading control. It is essential that the antibody under study is specific for the target protein and does not recognise other family members containing highly homologous sequences and does not cross-react with unrelated proteins. One straightforward method to determine if your antibody cross-react with other protein is to use transiently transfected cells (e.g. COS-7, HEK293 cells) expressing different members of the relevant protein family. The specificity of antibody CHU61B for PIM2 protein was tested in a variety of different assays. Recombinant PIM1, PIM2, PIM3 and PLK1 proteins were prepared and used in an indirect ELISA and Western blotting studies. 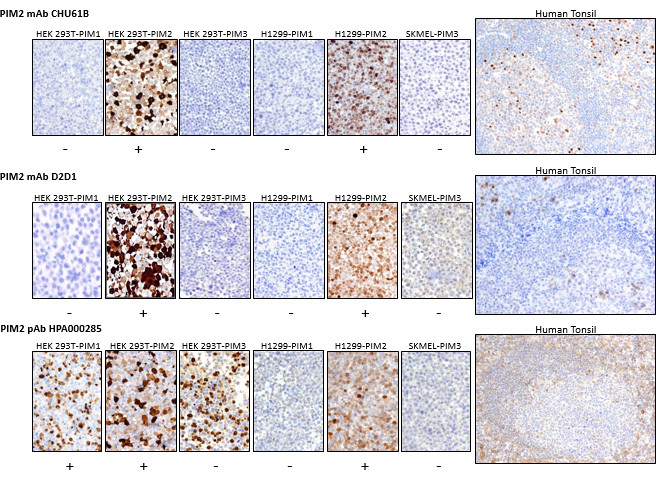 The reactivity of antibody CHU61B was also studied in immunohistochemical labelling of transiently transfected HEK293T cells expressing PIM1, PIM2 or PIM3, stable H1299 (lung cancer derived) transfectants expressing with PIM1 or PIM2, SKMEL (melanoma-derived) cells and a human tonsil. The results are shown below. Figure legend Demonstration of the specificity of the antibody CHU61B for PIM2 and not for the other two members of the PIM family. A) An ELISA shows reactivity of CHU61B with PIM2, but not with full length PIM1 and PIM3 family members. 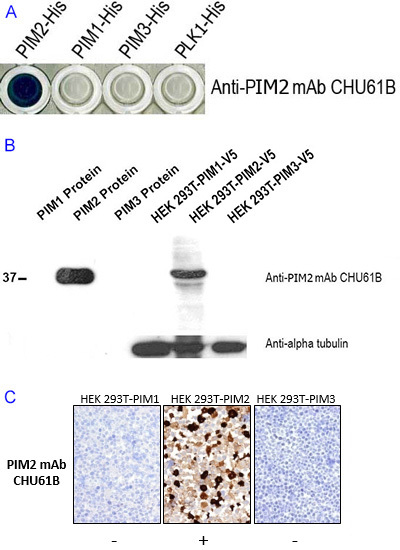 B) The specificity of the CHU61B monoclonal antibody was also confirmed by Western blotting using PIM1, PIM2 and PIM3 protein and cell extracts of transfected cells expressing PIM1, PIM2, and PIM3. 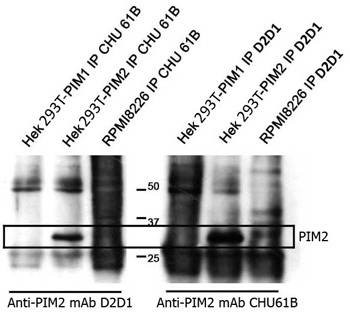 Antibody CHU61B detected a 36 kDa band only in the PIM2-HIS recombinant protein and HEK-PIM2 cell extracts, further confirming the specificity of the antibody for PIM2. Tubulin was used as a loading control. 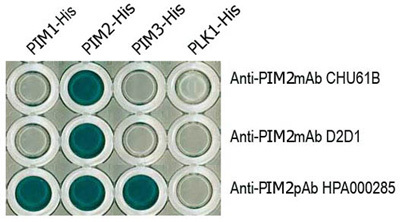 C) Immunoperoxidase staining studies show anti-PIM-2 antibody, clone CHU61B to strongly label HEK-PIM2 transfectants and no labelling was seen in PIM1 and PIM3 transfected cells. It is essential to compare the results obtained during the validation process with any predicted/expected results. A recent article by Asano et al., using immunohistochemistry described PIM2 protein expression in both multiple myeloma cells and RPM1 8266 and U266 (two myeloma-derived cell lines); The observed results correlated with those described above during the validation steps. More than one antibody recognizing different epitopes are often available for the study of a particular target antigen. The opportunity to study more than one antibody recognizing different domains within the same protein using a variety of techniques described above is an excellent approach to identify the most specific and suitable antibody for research purpose. The advantage of this approach is demonstrated by this example of comparing three available antibodies (rat anti-human PIM2 monoclonal antibody, clone CHU61B, rabbit anti-human PIM2 monoclonal antibody, clone D2D1 and the rabbit polyclonal anti-human PIM2, batch # HPA000285). The specificities of the three different antibodies were tested on the PIM family of recombinant proteins using A) ELISA and B) Western blotting. Cell extracts of HEK-PIM transfectants, Jurkat (T-cell lymphoma derived), Ramos (Burkitt lymphoma derived) and RPMI-8226 (myeloma-derived) cell lines were also tested in Western blotting studies. Proteins from HEK-PIM transfectants and the RPMI-8226 were C) immunoprecipitated prior to Western blotting. All three antibodies were also tested in immunohistochemical studies on transfectants cells and cell lines. Figure legend A) Results from an ELISA using PIM1, PIM2 and PIM3 full-length proteins and three different commercially available antibodies (mouse monoclonal CHU61B, a rabbit monoclonal D2D1 and a rabbit polyclonal HPA000285) advertised as recognising PIM1. The PIM family of recombinant proteins were plated on an ELISA plate and tested with all three antibodies to PIM2. Only the CHU61B and D2D1 monoclonal antibodies were specific for the PIM2 protein. The polyclonal antibody (HPA000285) detected all three PIM family members. Note the absence of reactivity of all the antibodies with the negative control Plk-1 protein. Figure legend Western blotting was performed using extracts of PIM1, PIM2, PIM3 proteins, PIM1, PIM2 and PIM3 transfected HEK293T cells, Jurkat T cell lymphoma (PIM2-negative) and the PIM2-positive Ramos and RPMI8226 cell lines (from left to right of each membrane). Both, the clone CHU61B and clone D2D1 anti-PIM2 monoclonal antibodies detected a 36 kDa band in the PIM2-HIS recombinant protein and a 26 kDa band in the HEK-PIM2 cell extracts while the staining was absent in PIM1, PIM3 proteins, HEK-PIM1 and HEK-PIM3 transfectants. 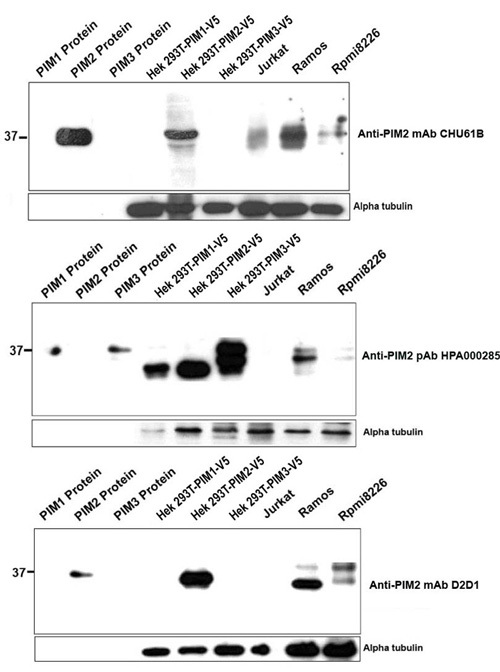 In contrast, the anti-PIM2 polyclonal Ab (HPA000285) recognised bands in all three PIM recombinant proteins and transfected cells, indicating its lack of specificity for PIM2. Of interest was the finding that two or three different bands corresponding to the different PIM2 isoforms of 34, 37 and 40 kDa were also observed in Ramos and RPMI8226 cell extracts using all three antibodies. Figure legend Results from immunoprecipitation and Western blotting studies. Protein extracts from HEK-PIM2 and RPMI-8226 cells were immunoprecipitated with either antibody clone D1D2 or clone CHU61B. HEK-PIM1 transfectants were used as a negative control. The immunoprecipitates were then subjected to Western blotting. In both cases a band of 34 kDa was observed in the HEK-PIM2 cell extracts confirming antibody specificity to PIM2. Figure legend Immunoperoxidase labelling studies on transfected cells, human cell lines and tonsil using all three antibodies advertised as recognising PIM2. Staining was performed using a specially designed small tissue array containing cell pellets of: HEK293 cell line transiently transfected with PIM1, PIM2, PIM3, the cell line H1299 stably transfected with PIM1 or PIM2 and a tumour cell line, SKML that expresses endogenous PIM3 protein and a sample of reactive tonsil. The rat monoclonal CHU61B and the rabbit monoclonal D2D1 antibodies exhibited similar pattern of labelling (staining only the PIM2 transfectants and the nuclei and cytoplasm of plasma cells and some cells in the germinal centre). In contrast, the rabbit polyclonal antibody (HPA000285) was not specific for PIM2 and stained the PIM1 and PIM3 transfected cells and also labeled greater numbers of cells in the tonsil. These results demonstrated that while the rat and mouse monoclonal antibodies were specific for PIM2, the polyclonal antibody (HPA000285) cross reacted with other PIM2 proteins and was not, therefore, suitable for the specific study of PIM2 protein.